Solid Brass Dog Name Tags Guaranteed For Ten Years. Made in England from Brass. *Yes, even if you lose it. A Dog Name Tag for Ten Years? Even if I Lose it? We got tired of our dog’s ID tag getting lost, fading away, or just falling to bits (usually the latter). So we made a better one. Out of solid brass. What if I want a different size dog name tag? Have a word with Louise. 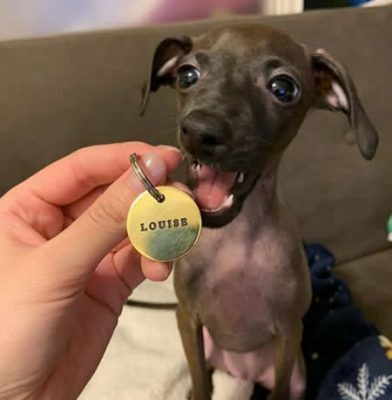 She’s a ridiculously glorious Italian Greyhound who is clearly DELIGHTED with her 27mm dog name tag that made it all the way to Japan for her. Please don’t eat it Louise. 27mm is the perfect size for all dogs. If you really want a larger, smaller, bone-shaped, or amphibious landing craft shaped one (yes, we have done one of those) by all means ask, we will let you know if we’re able to right away. What should I put on a dog tag? Good question! This is where most people answer you by starting to quote the outdated Control of Dogs Order. We’ve written a whole page on why this is Order is out dated and not fit for purpose. Basically, it’s a 1992 law that does not take into account that everyone has a mobile phone and – importantly – every dog is Microchipped with its owner’s information (law since 2016). At Ten Year Tags we do not point people at the control of dogs order. We know all the dogs we tag are kept under control and properly looked after at all times. 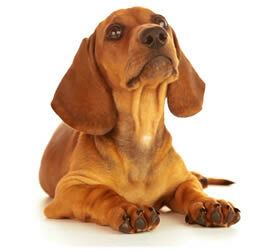 We recommend a name – your dog’s name or yours – and a mobile phone number. It’s up to you of course! We’re happy to engrave what you want. Here’s that page about the 1992 Control of Dogs Order. Will you send a dog name tag to my country? Oh go on then. We use Royal Mail and charge £2.99 for First Class* shipping. *Everything we do is first class here at Ten Year Tags. Royal Mail says 5 to 7 days for Rest of World and 3 to 5 days for Europe. Sometimes it’s quicker, sometimes slower. Do remember to give us 3 days in the workshop to make your dog name tag by hand too of course. We recommend the perfectly-sized 27mm Dog Tag, it’s made from 2mm thick brass, which enables us to guarantee your dog name tag for Ten Years. Yes. Even if you lose it. Most novelty shapes and different, thinner materials, just can’t be engraved deeply enough, are weaker and far more prone to breaking or wearing away. We can now make a larger (33MM) dog name tag for those really big dogs out there. Want a bone shape? Well okay, don’t tell anyone though. We’ve designed our own to meet our exacting quality standards. 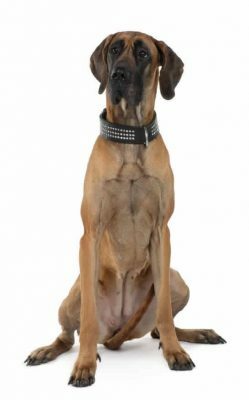 All dog name tags you buy from Ten Year Tags are made to last Ten Years or more of course and carry our unique Ten Year Guarantee. Can you engrave a specific font for me? Not every font works, but if you have a favoured font, let us know and we will both try it out AND find a near-alternative that we know will work. FREE (UK) First Class delivery. All orders shipped within 2 or 3 days, usually sooner! No, it does, honestly. Check it out. If you’re a customer we’ll retain a few things – the name and phone number on your tag for instance – so we can quickly get a replacement to you should you need it. You can access, download or delete any data we might have at any time by going to this handy Privacy Page. We recommend one or two lines, but we can fit three or four on if that's what you need. The more text, the smaller it will be of course. 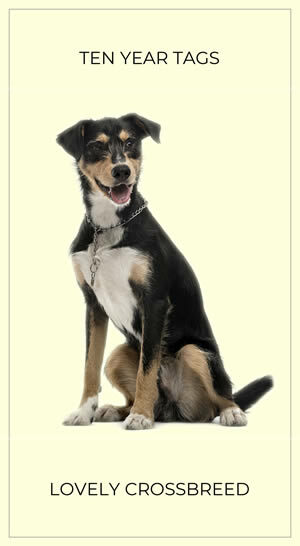 Again we recommend the easiest, clearest information that's going to get your dog reunited with you. However, if you want four lines, we'll do our best to make it fit! Another number, an address, or anything else! We layout what you ask for so it's as easy to read as possible. Let us know if there's anything specific you need. A Boy or Girl Dog? Not essential, but we'd love to know! It's a Cockapoo of Course! Remember: Your Ten Year Tag Is Guaranteed for Ten Years. Even If You Lose It.